From that perspective it’s never been meant to be perceived as a ‘Best of’ list but, rather, as a taster of some of the most exciting work on offer – from practitioners of DIY culture right up to boutique publishing outfits. As ever, the “UK” label is a little fluid but anything published here is fair game for inclusion. You can read previous editions by following the links here for 2012, 2013, 2014 and 2015. I say this every time I write an introduction to one of these articles but reducing this shortlist to just ten comics gets harder and harder with each passing year. Please look through the full ‘Small Pressganged‘ 2016 archive to discover more self-published sequential art splendour to add to your collections. In particular do check out the many anthology books that were on offer over the last twelve months as the focus below is on individual artists rather than group efforts. To all things an ending. Simon Moreton’s groundbreaking and influential Smoo Comics came to an end with its tenth issue in 2015 but that final number’s mix of comics material, illustration and text provided a perfect transitional point between Smoo and his new zine project Minor Leagues. 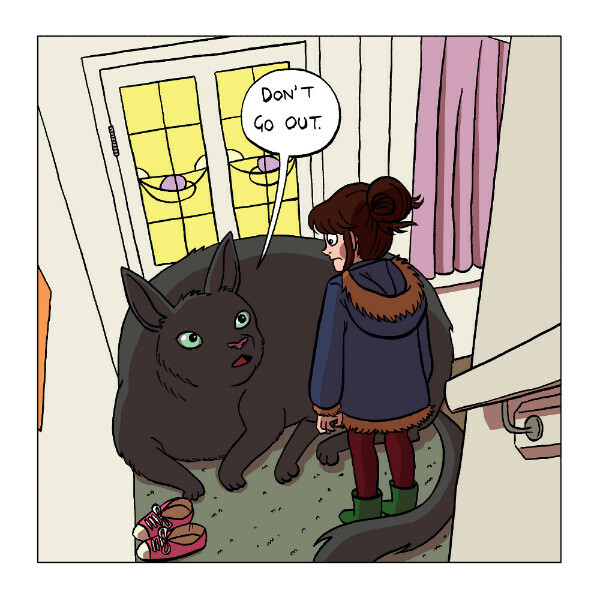 Nominated in this year’s Broken Frontier Awards in the Best New Series category, Minor Leagues combines prose, poetry and comics, taking Moreton’s recognisable and evocative autobio to new mediums. 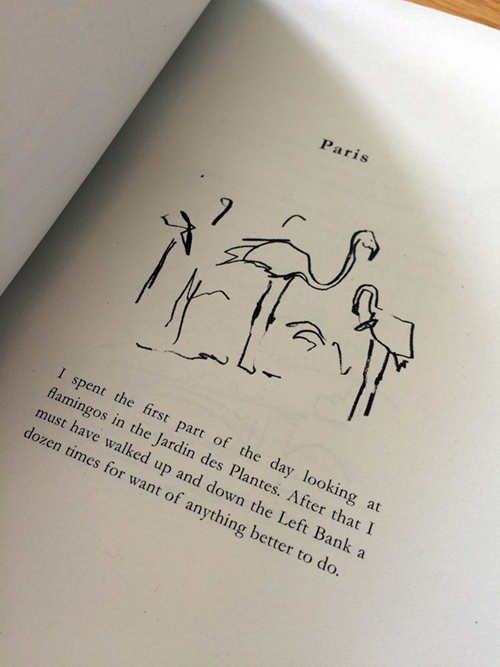 Those who appreciate his minimalist comics meditations on life will not be disappointed but this is also a Simon Moreton keen to experiment with the possibilities of other storytelling forms; to investigate and manipulate their narrative strengths to convey the emotional themes at the heart of his work. Perhaps more than ever before in Moreton’s zines the fleeting, often ephemeral nature of existence is emphasised and explored in this opening issue. 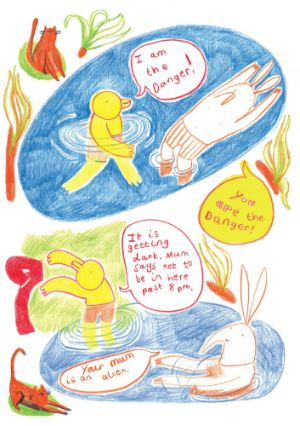 Minor Leagues marks a bold new beginning for one of the UK small press’s most vital practitioners but one that builds on the foundations of his seminal Smoo Comics. 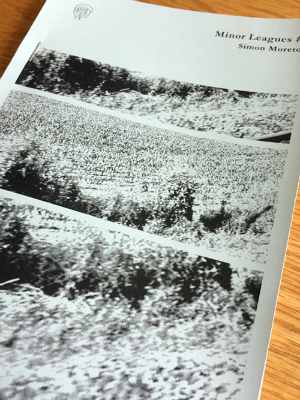 Small Pressganged soundbite: Minor Leagues marks an evolution in the practice of Simon Moreton and an essential and accessible entry point for those yet to have discovered the work of this singularly vital presence in self-publishing. 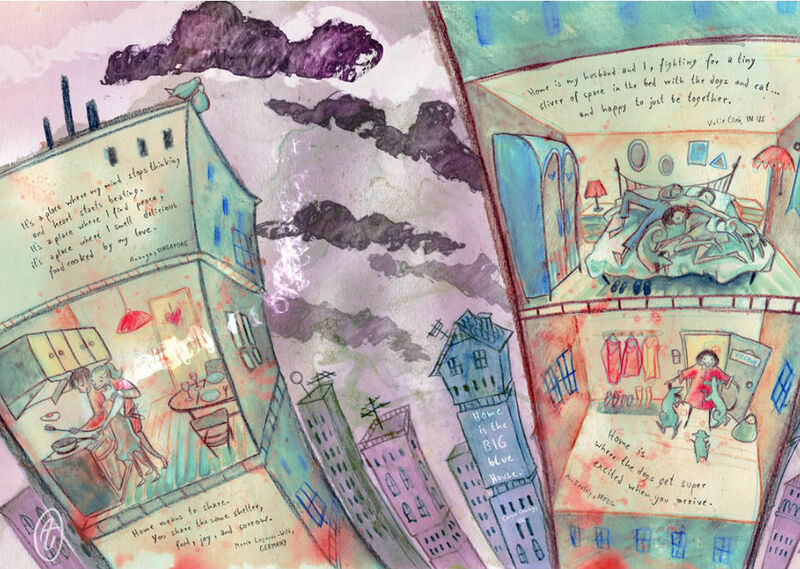 What an astonishing year it was for 2015 Broken Frontier ‘Six Small Press Creators to Watch‘ artist Rozi Hathaway. 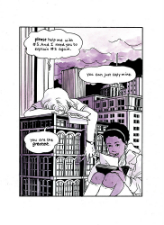 She was a featured artist in the Broken Frontier Small Press Yearbook, contributed to anthologies like Dirty Rotten Comics and Dead Singers Society, and edited the second volume of her own anthology Sneaky Business. But it was her work on solo projects like Ø and Njálla that cemented her position as one of the now firmly established active talents on the UK small press scene. 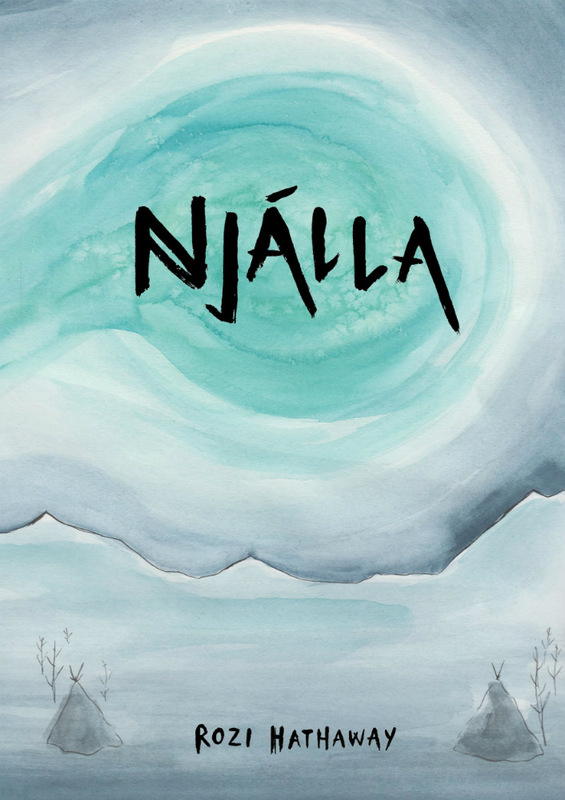 Reaching its Kickstarter target just a few short hours after the campaign’s launch, Njálla was an assured longer-form debut from the artist. 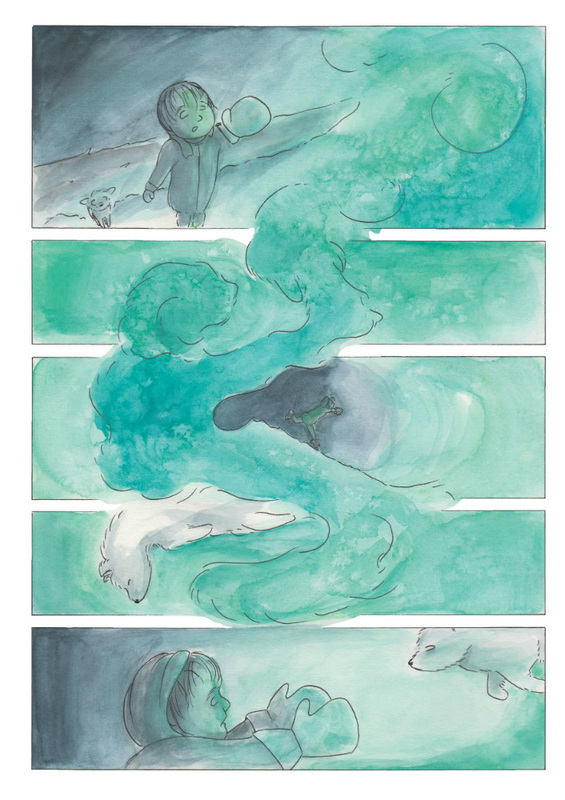 Based on the legends of the Sámi people, it tells the story of a young girl Lieđđi and her baby reindeer companion Unni as they encounter the arctic fox-like spirit creature of the book’s title and attempt to restore a supernatural balance to the skies above them. 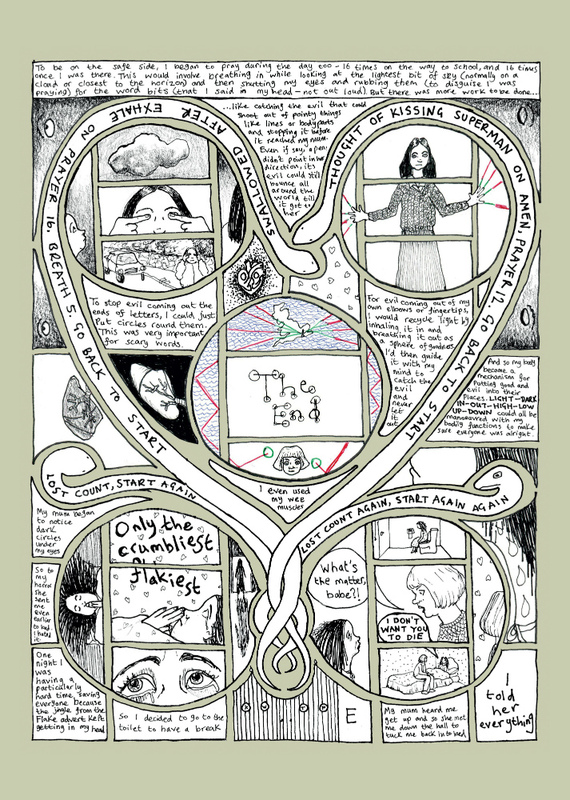 After picking up a copy on Small Press Day, Warren Ellis himself remarked in his e-mail newsletter that it was “a remarkably pure piece of fabulist storytelling”. 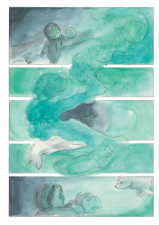 One of the absolute standout all-ages comics of 2016, Njálla is a stunningly beautiful comic; a haunting and touching reading experience. Small Pressganged soundbite: A stunning synthesis of unearthly mystery and endearing innocence, Njálla underlines once again the subtle potency at the heart of Hathaway’s craft. 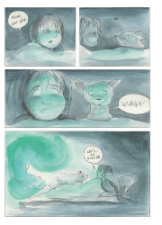 Olivia Sullivan, aka Zen Bucko, has come a long way since her first tentative forays into the comics world in the pages of that vital anthology platform for new small press voices Dirty Rotten Comics. 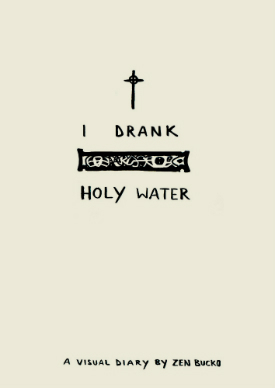 I Drank Holy Water is her uncompromising autobiographical account of her childhood relationship with religion, chronicling her early rebellion against its arcane rituals and inexplicable strictures. The book then looks at the effect those years had on her in later life with a raw and uncomfortable candour. 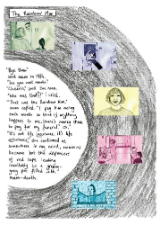 While its subject matter may have been oft explored it’s Sullivan’s distinctive approach that impresses with its shifts from anecdotal dark humour to stream-of-consciousness imagery, all given extra resonance by her affecting use of language. A creator to keep a close eye on, Olivia Sullivan’s use of the medium grows more confident with every outing. Expect big things from her in 2017 especially with a book coming from micropublishers Good Comics. 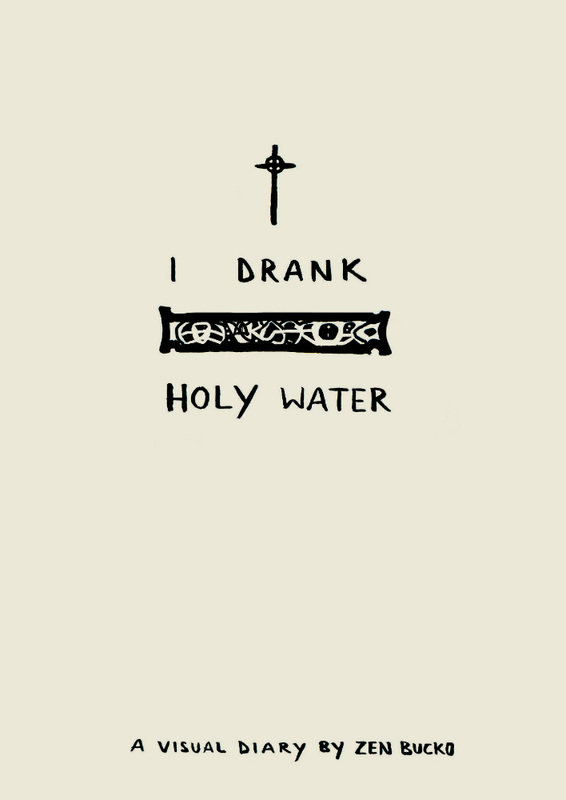 Small Pressganged soundbite: If such a thing can be said to exist then it could be argued that Zen Bucko’s art has a strangely caricatured realism to it – a distorted verisimilitude that echoes its dark and very personal monologue. 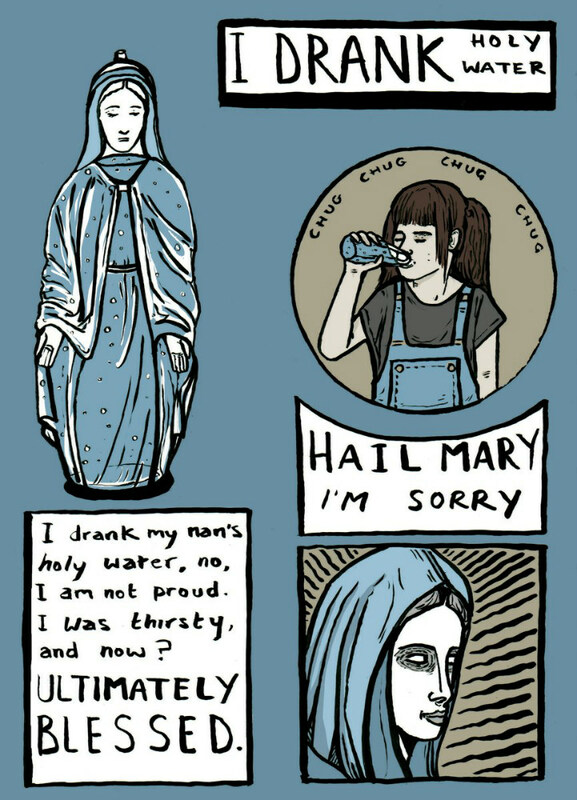 For more on Olivia Sullivan’s work visit her site here and follow her on Twitter here. You can find her online store here. 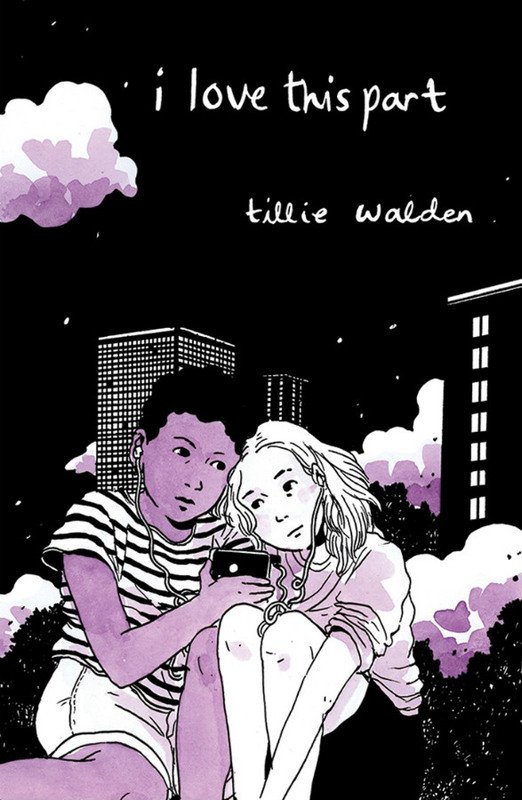 I was a little late in covering Tillie Walden’s second offering from Avery Hill Publishing and it crept into 2016’s line-up of reviews in January but there was no way this one-shot masterpiece would not be included in a ‘Ten Small Press Comics You Need to Own! round-up at some point. Since this review appeared, of course, Walden has gone on to Eisner nomination and a double Ignatz Award win and it’s hardly a mystery as to why. This heart-rending slice-of-life offering traces the growing relationship between two young girls as friendship blossoms into something far more profound. Using powerful visual metaphor Walden presents a tale that reminds us of the fragility of first love, of that time when our whole existences become wrapped up in someone else and when everything external appears inconsequential and unimportant in comparison. 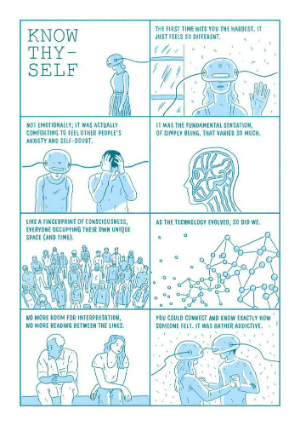 So assured in structure, displaying a remarkable command of the language of the form and forging the most intimate connection between reader and page, I Love this Part is pure comics genius. 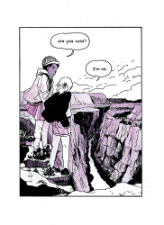 Small Pressganged soundbite: Touching, poignant, occasionally funny, and quietly devastating… I Love this Part is a comic of rare, raw and precious beauty. For more on Tillie Walden’s work visit her site here and follow her on Twitter here. You can buy I Love this Part from Avery Hill’s online store here. 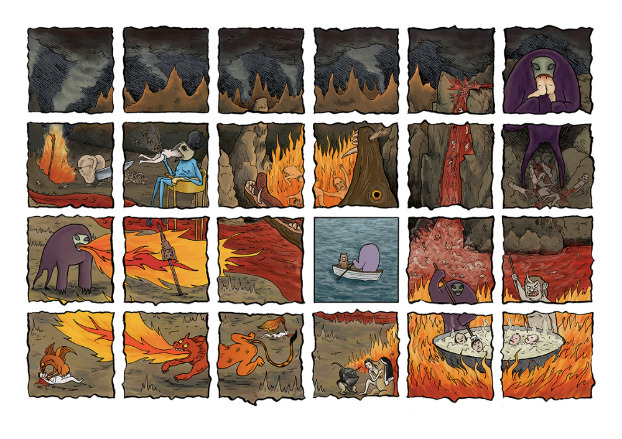 Andy Poyiadgi was the winner of the 2015 Broken Frontier Best One-Shot Award for his tender Lost Property from Nobrow Press. There’s often a gap between Poyiadgi projects but you can always guarantee that it’s one that’s well worth the wait. 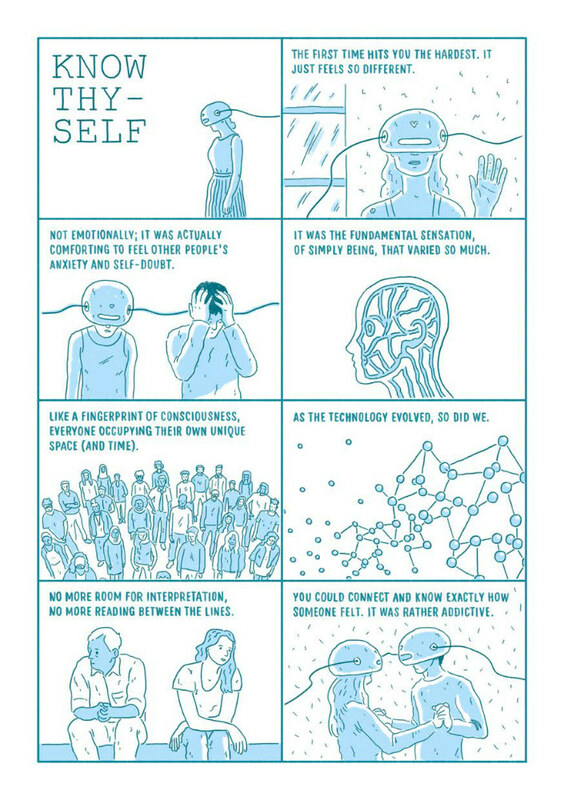 Debuting at ELCAF this year, Veripathy explores the premise of a world where technology has allowed people to directly experience the emotions of their peers via a device known as a “veripathic communicator”: a headset-style contraption that connects individuals empathetically. At just 20 or so pages Poyiadgi makes more telling points about our interactions with each other than some creators could in an entire graphic novel and yet he retains a detached and subtle narrative voice throughout. A carefully chosen colour palette, a delicate sense of graphic design and intelligently measured pacing make this some of Poyiadgi’s finest work to date. Small Pressganged soundbite: Sublime in its emotional impact this is a compact comic replete with far more incisive observations on the human condition than its short page could ever suggest. 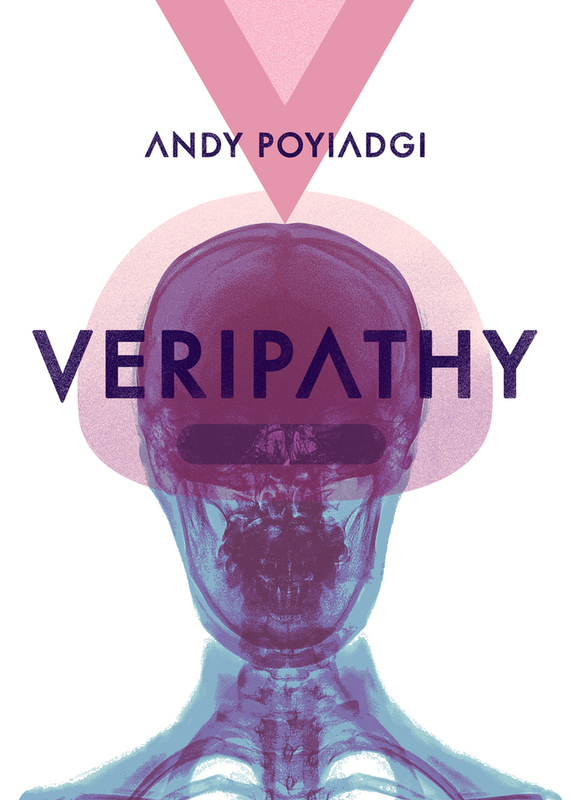 For more on Andy Poyiadgi’s work visit his site here and follow him on Twitter here. You can find his online store here. 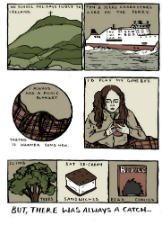 That such a singular talent as 2014 Myriad First Graphic Novel Competition finalist Wallis Eates still doesn’t have a publisher for her idiosyncratic and penetrating autobiographical comics remains one of the great mysteries of UK indie comics to me. Eates is adept at making the most acutely observational social commentary in her work and discovering moments of wonder in the foibles of her sprawling cast of characters. Fear of Mum-Death and the Shadow Men is the first extensive collection of her comics shorts and mixes older material with all-new content. It was also nominated for a Broken Frontier Best One-Shot Award this year. 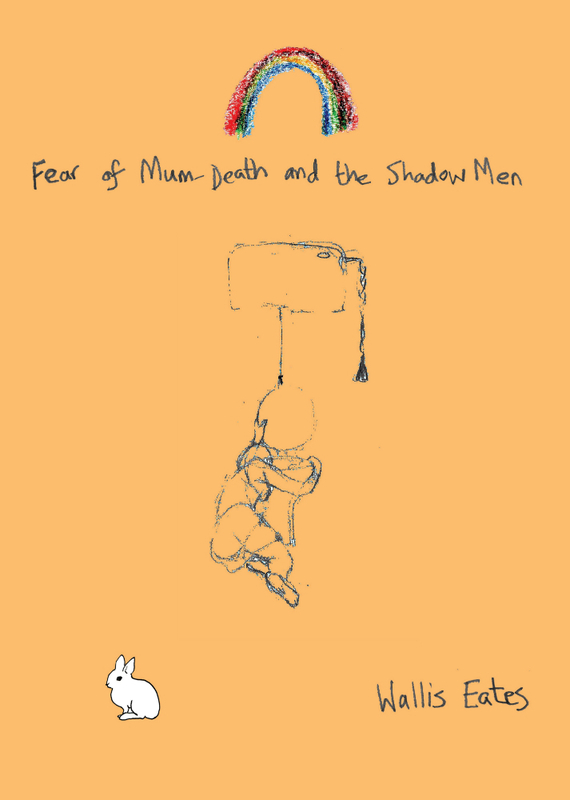 Ostensibly Fear of Mum-Death and the Shadow Men is about the anxiety of parental loss and Eates’s own relationship with her mother but that only begins to describe the depth of the material on offer here. 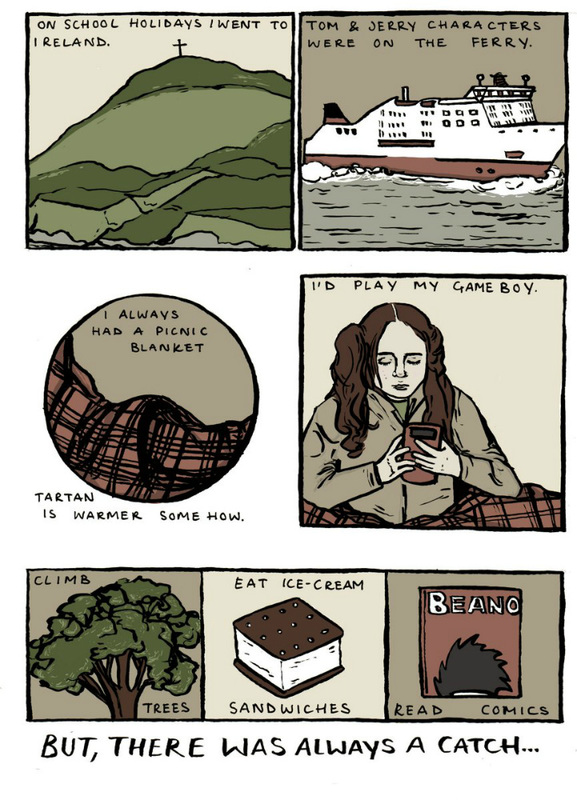 It’s also a comic about the reliability of memory, the often fleeting nature of our relationships with those whose lives touch our own in important and profound ways, and how our perceptions of the world around us change with age. Few creators working in the autobio strand of comics have the ability to elicit such a powerful emotional response from their readerships as Wallis Eates does. It’s time she got the long overdue recognition she deserves. 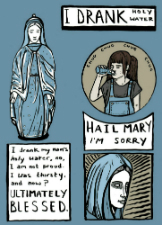 Small Pressganged soundbite: We can only hope that this collection is the final step towards someone out there picking up Mumoirs because Wallis Eates continues to produce comics that speak to us all with their emotional immediacy and unyielding candour. This is work that doesn’t just deserve a wider audience, it’s owed one. For more on Wallis Eates’s work visit her site here and follow her on Twitter here. You can find her online store here. 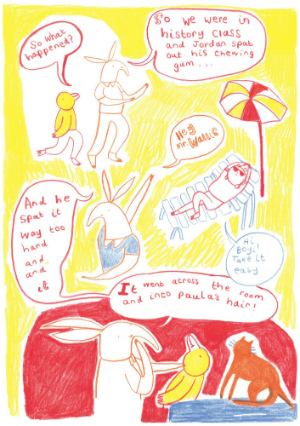 Anja Uhren’s graphic narratives have tended towards dark fantasy and fantastical elements to date but What is ‘Home’? is a very different project indeed. 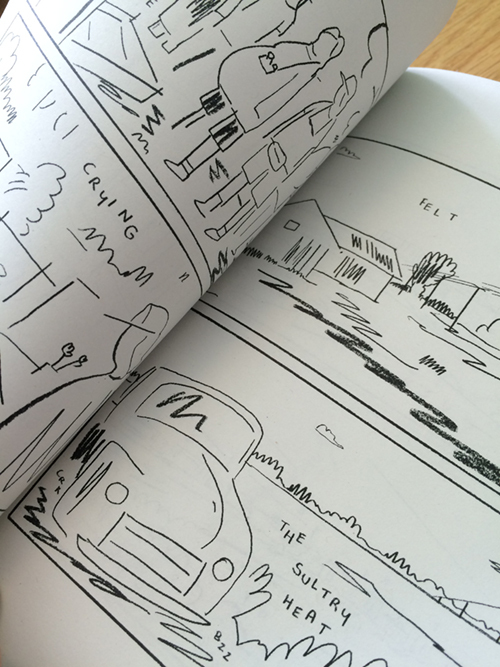 Collating the thoughts of fifty or so contributors on their personal definitions of what constitutes a home Uhren brings their contrasting views to life in a series of illustrated shorts. The interpretations of the concept may be literal (a physical environment) or more abstract (a sense of family perhaps). They may relate to the comfort of childhood, to a notion of security or to a set of memories. And in some cases the voices herein connect the idea of home to something out of their reach, underlining their feelings of loneliness and despair. Uhren captures the resonance and mood of each entry with gorgeous, dream-like visuals that flow and drift across the page. 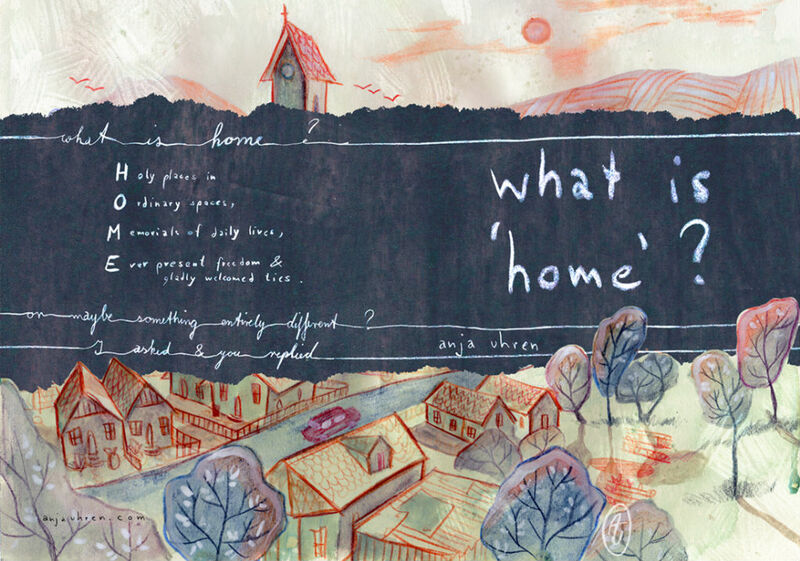 Like much of Uhren’s work What is ‘Home’? is also a very tactile reading experience with handbinding and fold-out elements. A sumptuously composed invitation into the lives of others that delights and moves in equal measure. Small Pressganged soundbite: What is ‘Home’? is a touching and gorgeous collection of vignettes that are imaginative in design, expressive in message and stunningly rendered in delivery. If you’re unfamiliar with her comics then your entry point into the lyrically beautiful work of Anja Uhren should most assuredly begin here. Expect the unexpected. That’s a rather trite soundbite but it has a certain validity (and an assured veracity) when it comes to Avery Hill Publishing. The South London micropublisher have had a phenomenal year – a phenomenal three years let’s be honest – and they finished their programme of releases this year with Steven Tillotson’s Untitled Ape’s Epic Adventure; a book that’s up there with Tillie Walden’s I Love this Part and EdieOP’s Maleficium as one of my favourite AHP releases to date. Tillotson exploits the storytelling possibilities of his landscape format tale with flair and while this seemingly dark and cynical fantasy may appear pessimistic and morbid on a surface level there are themes of friendship and the importance of family at its heart that are universal. 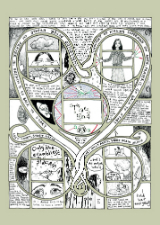 A triumphant finale to AHP’s 2016 and a book that should ensure a revival of interest in the unique approach of UK small press stalwart Tillotson. 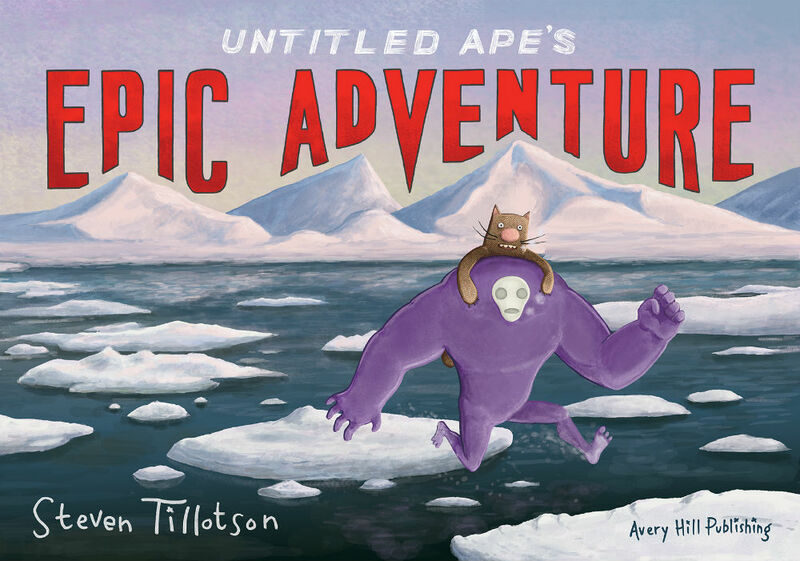 Small Pressganged soundbite: Untitled Ape’s Epic Adventure is a graphic novel that is entirely at ease with its own cynical wit and one that will undoubtedly propel Tillotson – perhaps one of the UK small press scene’s most undervalued mainstays – to a whole new level of deserved recognition. 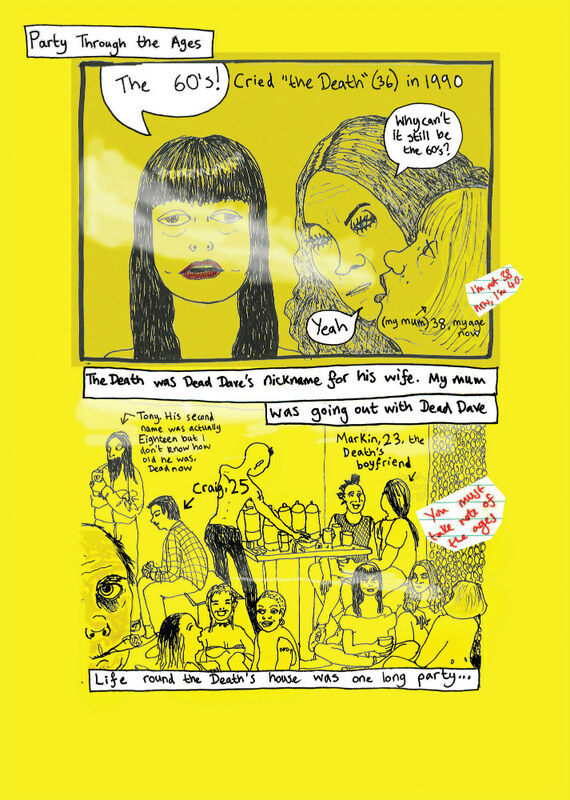 Fans of Rachael Smith’s output over the years – from her self-published beginnings to her full-length graphic novel House Party at Great Beast through to her acclaimed Avery Hill books The Rabbit and Artificial Flowers – will be aware of the empathetic nature of her protagonists and her ever nuanced and relatable characterisation. 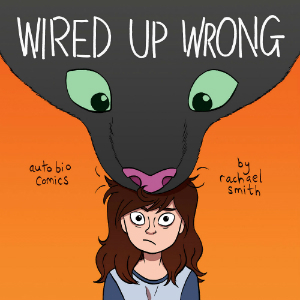 The accessibility of her fictional narratives is one of their greatest strengths but in Wired Up Wrong Smith takes that ability to build such an intimate rapport with her readership to a different subject matter in an autobiographical graphic medicine collection that represents some of her strongest comics output to date. 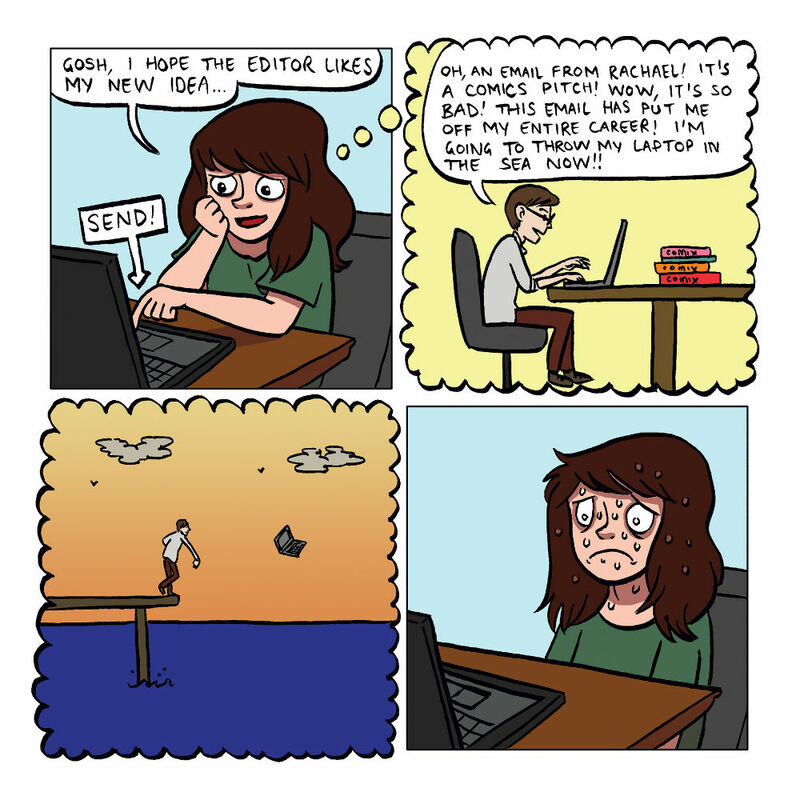 In 40-plus pages of strips Smith looks at her own struggles with anxiety and depression and the impact it has had on her life. Fears about her career as a creator sit side by side with worries that seem more arbitrary; all given metaphorical life by the constant lurking form of her own “black dog” Barky. 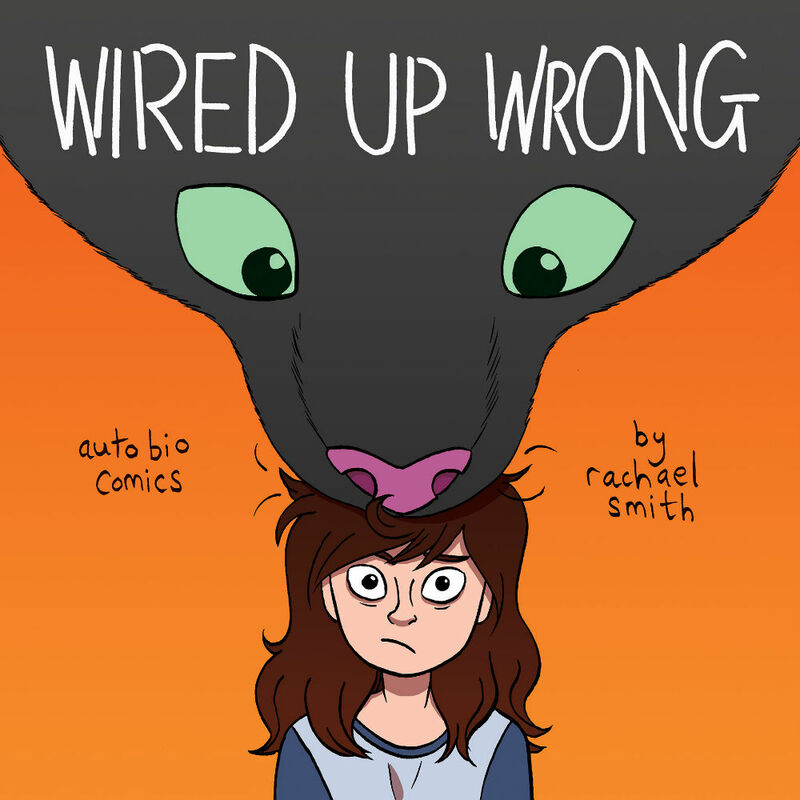 Poignant and funny, often self-deprecating but never trivialising the subject or patronising the audience, Wired Up Wrong was a sell-out on its debut at Thought Bubble last year, and with good reason. Perhaps Smith’s finest work to date. 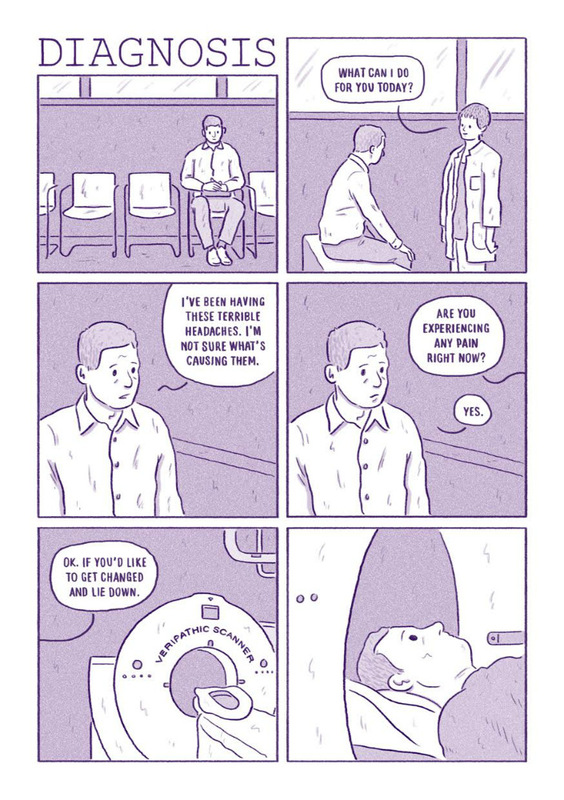 Small Pressganged soundbite: Possibly the most vitally important use of the form yet from one of the now established mainstays of the UK indie comics circuit, Wired Up Wrong destigmatises and informs in equal measure. 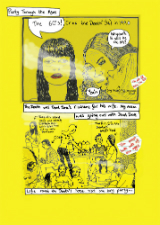 One of the hidden gems of DIY culture on the small press scene this year I Told You it Was Summer may have flown below many commentators’ radars given that it was only officially on sale at two shows this year – DIY Cultures and ELCAF. 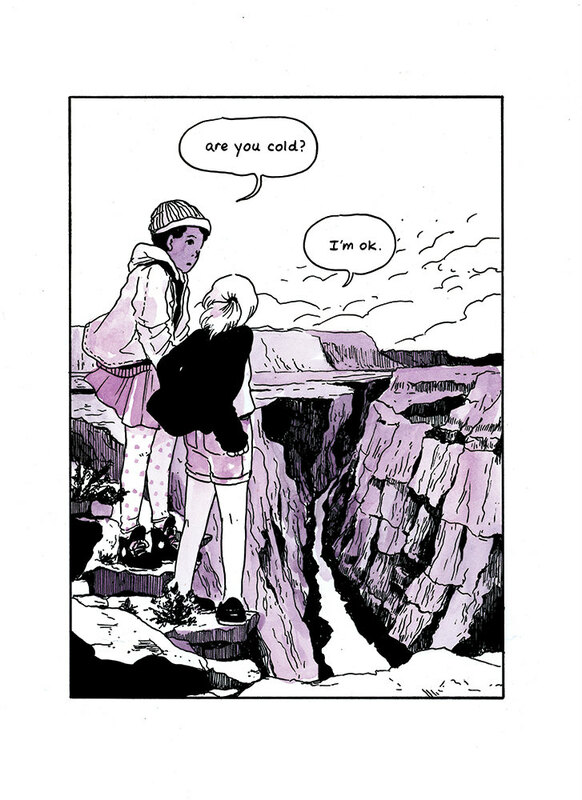 Kim Clements is, of course, the artist behind the Broken Frontier Award-nominated comic Rabbit Thoughts – the deeply moving story of a young woman’s struggle with loneliness – and one of 2016’s Broken Frontier ‘Six to Watch‘ creators. I Told You it Was Summer follows two young boyhood friends on one evening of fun, larking around, having adventures and discussing playground politics. 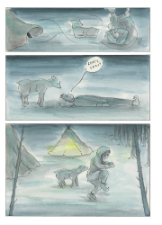 Like all of Clements’s comics work to date it’s illustrated in the faux naive style she adopts for her sequential art which, in this case, enhances that childlike perspective on the world that is so central to the narrative. While Clements’s work has a chaotic, undisciplined charm to it she also has a profound sense of dramatic pacing and this chummy drama is turned on its head in one later sequence that makes the reader totally re-evaluate everything that has come before. 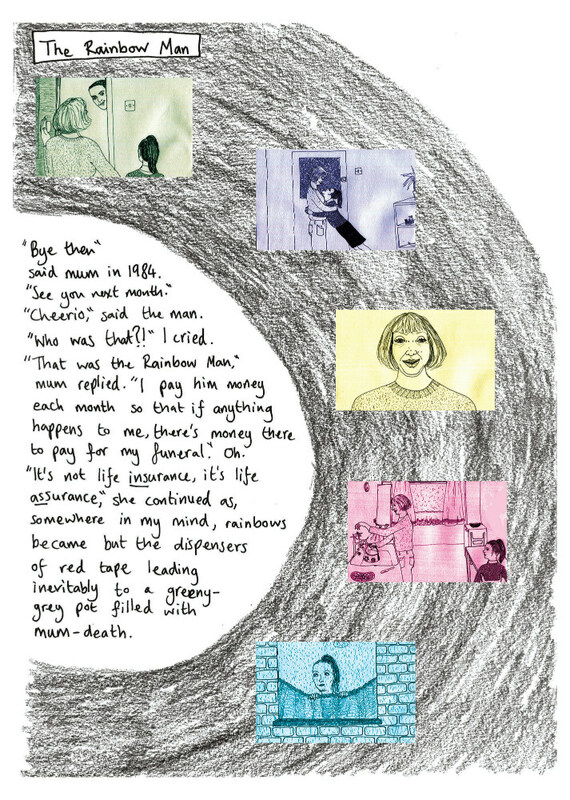 Heartbreaking and unforgettable, this minicomic is best read in its A5 incarnation to fully appreciate its strengths. 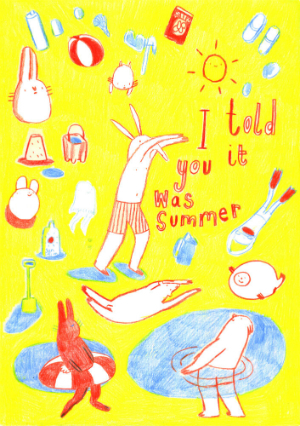 Small Pressganged soundbite: Subtle and enchanting, I Told You it Was Summer is a beautiful reminder of our childhood existences that nevertheless is unafraid to confront some darker truths. 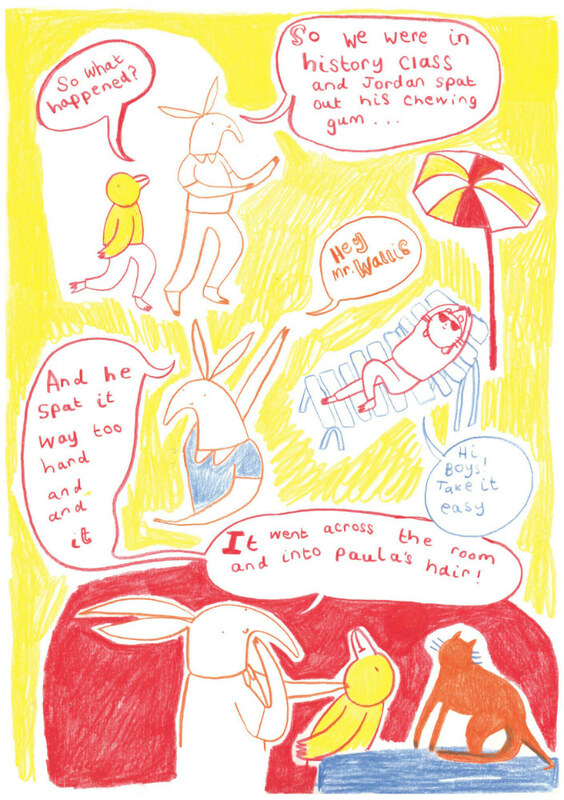 Once again, just like in the pages of her Broken Frontier Award-nominated comic Rabbit Thoughts, Kim Clements proves skilfully adept at combining superficial whimsy with more adult subject matter.